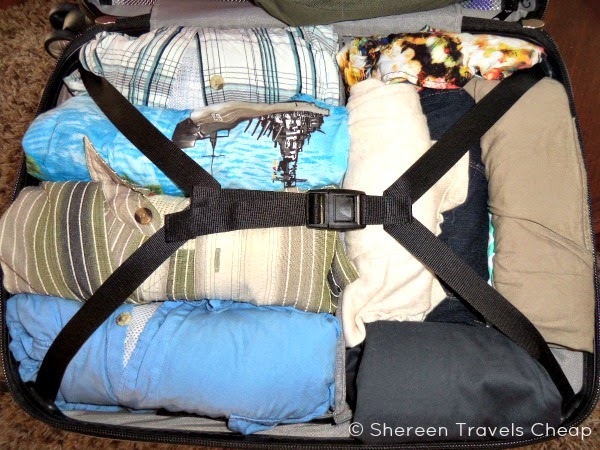 If you’re a chronic overpacker, then you’ve had the experience of wrestling your bag into the overhead compartment only to realize its bulging makes it impossible to shove it in and sit down. While everyone is giving you the stink eye for taking up space in the aisle to drag it back down to unpack the outside compartments, you vow to never pack too much again…you know, until it happens again. 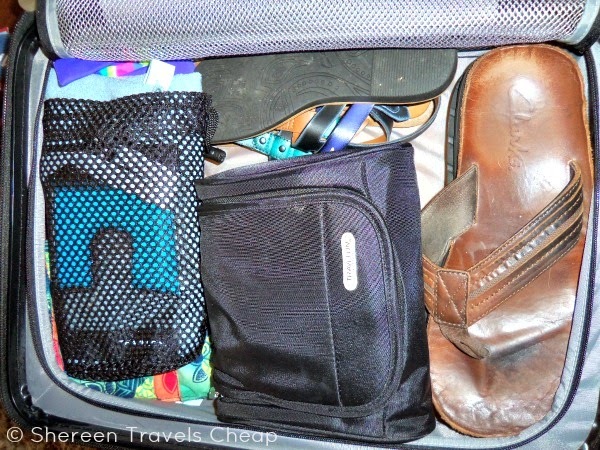 As much as I love those outside pockets on my carry-on bags, it can be too tempting to stuff them full of things that didn’t necessarily fit inside. Then I get the angry look from both my husband and other passengers, so it only happened twice before I stopped doing that. Does your carry-on take you sitting on it to get it closed, even when it’s expanded? Then maybe you need to try a hard-sided case. The EXO 2.0 from eBags is fantastic. It has all the inside features you want along with all the necessary outside requirements with the exception of extra compartments and an expansion zipper. Think you can’t get everything you need into this bag? Think again. 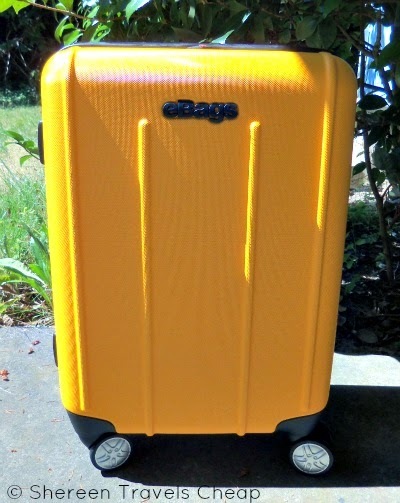 I put together all the clothing I would need for my trip to the East Coast this fall and decided to find out if I could get it all in the EXO 2.0 Hardside Spinner. Believe it or not, everything fit, including two packable rain jackets, sandals, a large travel towel and toiletry bag. 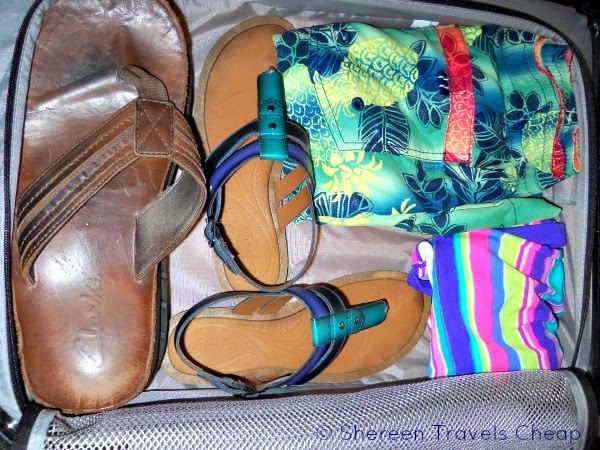 Above you’ll see both my travel wardrobe and my husband’s laid out. 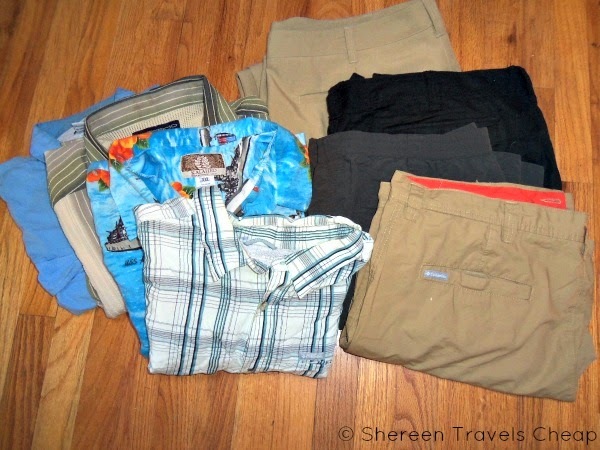 Because the weather is going to be both warm during the day and cold in the evenings, I needed to pack both pants and shorts, so this was an especially challenging packing job, with layering being necessary for both ends of the weather spectrum. Eric’s clothes take up more room than mine, which is fine, since I can normally pack his and then fit mine in the nooks and crannies left. It’s nice to be able to organize your clothing though and be able to open your bag and immediately find what you need, even if you’re just totally unpacking when you get to your destination. This carry-on is perfect for you if you like this as well. There is an adjustable divider/shelf on the one side that can be moved into a variety of positions to separate your items. In my case, I used it to put Eric’s heavier clothes on the bottom and my lighter ones on top. 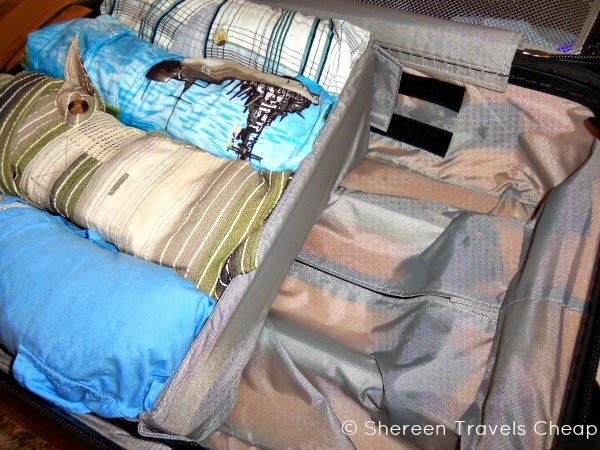 As you can see, it’s easy to see whose clothes are where, as the divider fits perfectly, plus it’s very sturdy, so if you haven’t packed your bag totally full, even when things are jostling around a bit, your belongings stay on the right side. 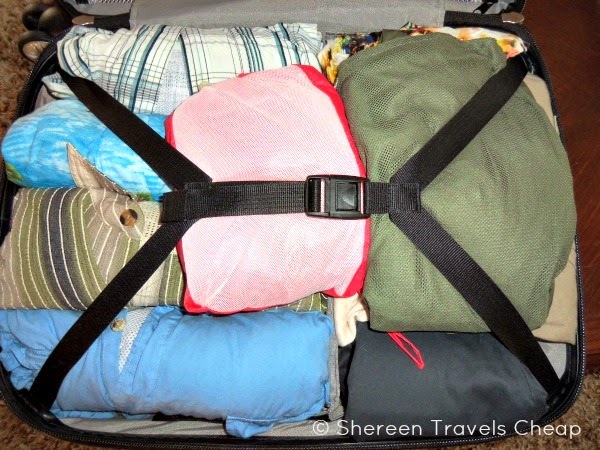 Compress your clothing to make sure it all fits snugly by using the innovative six-point adjustable tie straps. 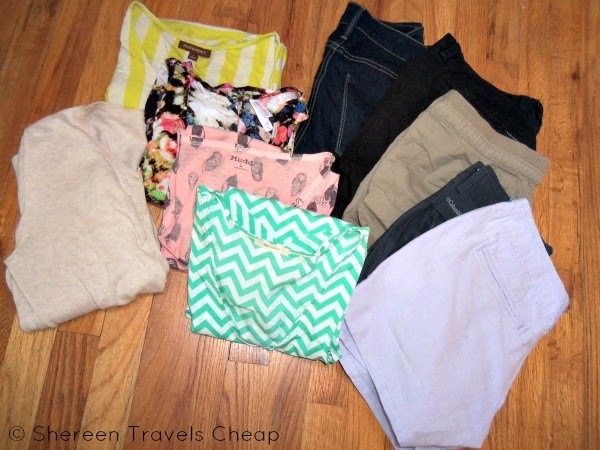 They seem to work better at evenly compressing your clothes and eliminating that wrinkle you might get with the traditional tie-down straps in regular luggage. This means you don’t get that side crevice either, giving you the illusion that you can (should?) actually pack more. The other side of bag has a great mesh zippered compartment, so you can see the contents easily. I always use this side for sandals, flip flops, undergarments, socks and swimsuits. 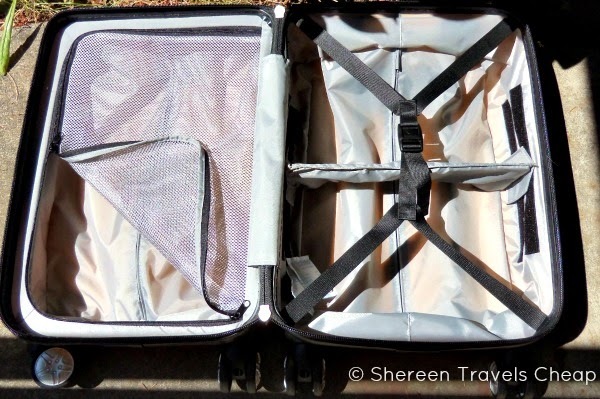 I found that it had more room than the usual mesh compartment, so I was also able to pack it in such a way that my toiletry bag fit inside and also my travel towel and waterproof phone case (for when I go to the beach or pool). I’d also like to take a second to address the fact that the inside of this bag isn’t black, so it’s not like packing your clothes inside a cave. The light reflects off the inside fabric instead of sucking it all in and making it impossible to differentiate between articles when the room isn’t all that bright to begin with. Though it might seem pretty straightforward, the outside of the bag is just as awesome as the inside. 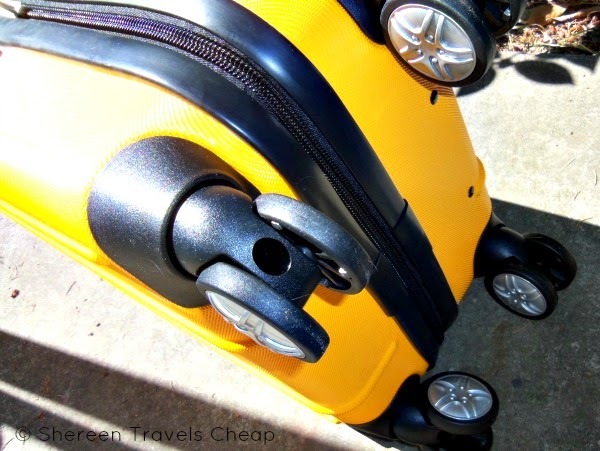 You have eight large and incredibly sturdy spinner wheels on the bottom, giving you an amazing rolling experience on all types of surfaces, including being able to glide your bag down the squishy airplane aisle without banging into everyone’s shoulders and/or knees like when you have to hug your regular rolling bag to your chest, because it only wheels one way. As much as I would like to be strong enough to carry it over my head, I’m not, and I’m sure that would create different sort of issues. Have you heard of those people who’ve been robbed out of their carry-on while it was in the overhead and they were sitting four feet away? If not, apparently this has become a problem on some flights, because people never know whose carry-on is whose and nobody suspects someone is going to try to sneak things out of other peoples’ bags on a plane full of people. I’ve never been the victim of this, but if you’re worried, this bag has your back. 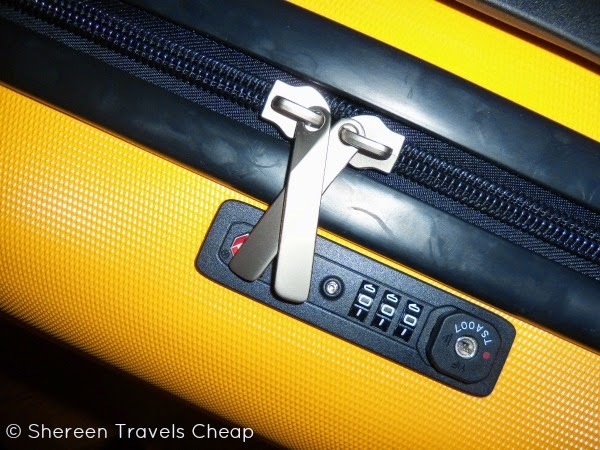 You can lock the zippers without making the TSA mad. Anyone can take a set of clippers to a zip-tie, and they are only one-use. The cross-over X zipper pulls lock easily and restrict access with a number lock. TSA can get in quickly with a universal key, but the lock is found on the side in the middle, so someone would have to pull your bag almost all the way out of the overhead to even try to open it and steal your stuff. Foiled! And while we’re talking about the zipper, let me point out the fact that it is self-healing, in case someone attempts to break it open with a pen – because that’s how some thieves do things. You don’t have to cry and buy a new bag. Just run the zipper back over the broken part and then watch it repair itself when you re-zip it. eBags has used the strongest zipper available, so even if you pack it a little too full, you won’t ruin it by pulling on the zipper a little too aggressively. 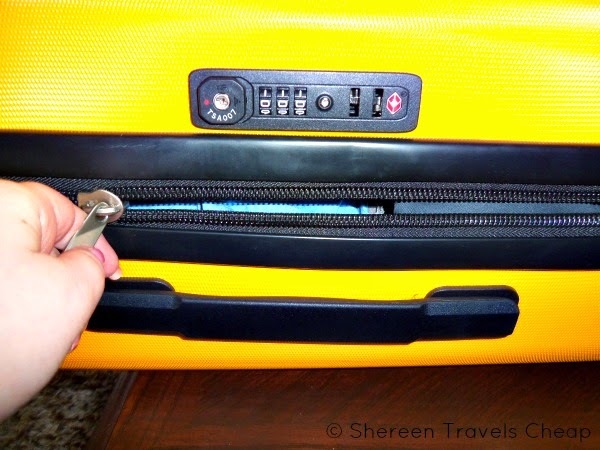 There are two heavy-duty handles on the outside – one on top and one on the side – making it easy to carry up and down stairs, get it into the overhead on the plane and also get it in and out of the trunk. On the side that doesn’t have a handle, you’ll find four recessed feet, so you aren’t putting your bag directly on the floor and possibly damaging the polycarbonate shell (though the pattern on it also reduces the chance of you scuffing up the outside and making it look super-used). Are you tall or short and travel with someone who is the opposite, or at least a noticeable enough difference that when you drag a bag behind you the handle may not work right for one of you? This can be a problem for us. The EXO 2.0 adjusts to three different heights, so everyone can pull it comfortably. And can we talk about the colors? I picked this bright yellow and I love it. It is easy to see, no one will mistake it for their bag, even on the baggage carousel, and it makes you excited to pack. Black, blue and red bags are becoming the norm. Don’t you want one that stands out and makes you happy? I sure do. This bag fits all my criteria. I even like the giant eBags logo on the back, because when people like something, they always want to know where you go it. Now they don’t have to chase you down the terminal to ask you. If only more bags had bigger logos that won’t catch on things and then fall off after your third trip with it. Save an extra 10% off + free shipping + 12% cash back (that's 2x the usual!). If you haven't signed up for Ebates, do it now quickly and easily and start saving big! Disclaimer: I was provided with the EXO 2.0 Hardside Spinner Carry-on for the purposes of this review, but all opinions are 100% mine.